A little protection goes a long way in helping keep our senior patients healthy. As a large proportion of the population moves into senior status (age 65+), the process of aging causes degenerative effects to our immune systems. That is why seniors become much more susceptible to basic illnesses and preventable diseases than younger populations. Viruses such as the flu that would affect a younger adult for only a few days can lead to breathing problems or pneumonia, even meningitis and some bloodstream infections in an older person. In addition, older adults with preexisting health conditions such as: heart disease; chronic obstructive pulmonary disease; diabetes, or cancer that has been recently treated with chemotherapy are especially at risk for contracting diseases. Recent fears of vaccine-preventable disease epidemics make evident that everyone, especially seniors, should be vaccinated. It is estimated that between 50,000 to 60,000 adults in the U.S. succumb to preventable diseases from lack of proper vaccinations. Although basic shots are available for seniors that have the potential to eliminate illness from afflicting thousands of seniors each year, nearly half of the senior population is reported to be unaware of the importance of vaccination. Neglecting proper vaccination not only puts seniors at risk, it also expands the potential for them to spread illnesses to others they interact with at home or in the community. Therefore, Dr. Zack believes it is essential to encourage his senior patients to receive the appropriate vaccinations to help protect their families, friends, neighbors, coworkers, and more. What are the Recommended Vaccinations for Seniors? Influenza: Dr. Zack highly recommends an annual flu vaccination for seniors, especially a patient with underlying high-risk conditions such as heart disease or diabetes, or those that interact with children. Getting flu vaccine annually is necessary since immunity is short-lived and the vaccine is updated every year to make sure it is designed to be effective against the current virus. Pneumonia -(PPSV23/Pneumovax 23): Pneumonia causes significant illness in seniors and is responsible for a great many deaths annually. Patients older than 65 who have been previously vaccinated should plan to have a one-time repeat vaccination within 5 years of the original shot, or if they were younger than 65 at the time of their primary vaccination. Those patients over 65 and others considered high risk who have never had the vaccine are strongly urged to schedule one with Dr. Zack before cold and flu season is upon us. Shingles (herpes zoster): Recommended for patients over the age of 60 who contracted the chicken pox disease during their childhood. Shingles is a viral infection that comes from the same virus that causes chicken pox. It can lie dormant in the body for decades before becoming active. The disease causes a blistery rash that although it isn’t life-threatening, it is usually very painful. Tetanus-Diphtheria-Pertussis (Tdap): More and more seniors are developing pertussis, or whooping cough, possibly due to fading immunity. The Tdap is a 3-in-1 tetanus, diphtheria, and pertussis vaccine given as a one-time shot, or after exposure to tetanus under some circumstances. Tdap is especially important for seniors in close contact with infants and children in day care. 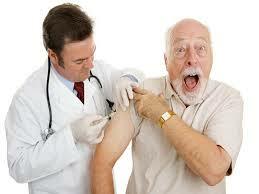 What Other Vaccinations Are Important for Seniors? In addition to the standard influenza and pneumonia vaccinations for seniors, several other suggested shots are equally helpful in protecting their health. Hepatitis A: A highly communicable viral liver disease. Good personal hygiene and proper sanitation can help prevent the spread of the virus. Hepatitis B: A contagious liver disease that comes from infection with the hepatitis B virus (HBV). An acute infection typically lasts a few weeks, but if the virus stays in the body, it can develop into a serious chronic infection that can lead to liver damage, liver cancer, and even death. In cases where a senior resides in a nursing home or assisted living facility, this is a particularly important vaccine to have. Prevnair 13 (PCV13): An extra level of pneumonia protection for seniors whose immune systems are already compromised due to age. Hib: Haemophilus influenzae type b vaccine prevents meningitis, and severe throat infection, and other serious infections caused by the Hib bacteria for adults with certain specified medical conditions who are already fully vaccinated. The Hib vaccine can be combined with other vaccines. One of the reasons that seniors often forgo recommended vaccines stems from a fear of the vaccinations actually causing the disease it is supposedly protecting them from. However, according to the CDC, you cannot become ill with the flu or pneumonia by receiving these vaccinations. In truth, you can only contract the flu, viral pneumonia or hepatitis from contact with an infected, contagious person (or remaining surface or airborne germs). Vaccinations actually aid the building of antibodies, which work to ward off potential infections. Discuss which vaccinations are right for you with Dr. Zack at Johns Creek Family Medicine, serving patients in South Forsyth, Gwinnett and North Fulton counties and surrounding North Atlanta area. In addition to promoting inoculation, Dr. Zack encourages his senior patients to take advantage of other preventative measures for avoiding germs, including good eating habits, ensuring you have adequate vitamins, exercise and sleep. Hand washing and disinfecting surfaces touched by others during cold and flu season is also recommended.